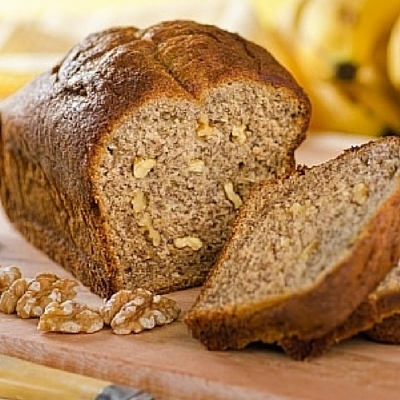 Walnuts give bread a nutty crunch and flavor. Walnuts are a nutty, slightly sweet nut. High in protein and essential fatty acids, the walnut is widely used by the food industry. It is baked in a number of products, used as a topping and coating, or sold by itself in a variety of forms. There are over 30 types of walnuts grown all around the world. However, the English or Persian walnut and the Black walnut are by far the most common.1 A thick green hull covers the light brown hard shell of the walnut kernel. The spherical “brain-shaped” nut is a off-white color. The Black walnut is native to the eastern and sometimes southern United States. Several Native American tribes used the bark and roots for a variety of purposes, but the nut less so, due to its tough hull. Walnuts are available in a variety of options, including roasted, salted, sweetened, shelled, candied, unsalted, whole, chopped, and crushed. The amount of the walnut that is left intact depends on the intended use. Halves are used for decorating; pieces are used inside food products; and granules for coatings and toppings. They can be added to doughs and batters, or used as a topping for variety of desserts or other foods. The nut can also be made into a walnut butter, or an oil can be extracted. Ground into a meal, it can be used as a partial flour substitute. Walnuts in their shells can be stored in a cool, dry place for several months without spoiling. Shelled walnuts should be kept in an airtight container and refrigerated. Walnuts are classified as “tree nuts” by the FDA. That makes them a “major food allergen,” and they must be declared on all labels, for any use. 2. Maguire, L. S., S. M. O’sullivan, K. Galvin, T. P. O’connor, and N. M. O’brien. “Fatty Acid Profile, Tocopherol, Squalene and Phytosterol Content of Walnuts, Almonds, Peanuts, Hazelnuts and the Macadamia Nut.”International Journal of Food Sciences and Nutrition 55.3 (2004): 171-78. 3. Campbell, Bruce C., Russell J. Molyneux, and Thomas F. Schatzki. “Current Research on Reducing Pre‐ and Post‐harvest Aflatoxin Contamination of U.S. Almond, Pistachio, and Walnut.” Journal of Toxicology: Toxin Reviews 22.2-3 (2003): 225-66. 4. Ertürk, U., T. Şisman, C. Yerlikaya, O. Ertürk, and T. Karadeniz. “Chemical Composition And Nutritive Value Of Selected Walnuts (Juglans Regia L.) From Turkey.” Acta Hortic. Acta Horticulturae 1050 (2014): 231-34.